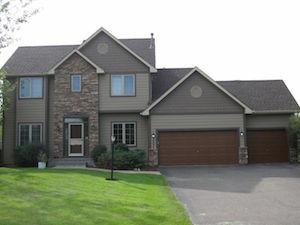 New siding is the fastest and easiest way to improve the appearance of your Minnesota home or business. Over time, siding will inevitably incur some degree of damage and deterioration, either due to severe storms or general wear and tear. When this occurs, the best solution is to invest in new siding for your home. Trinity Exteriors, Inc is your local siding contractor with access to the industry's leading siding manufacturers. One of our trained representatives will visit your home to determine the condition of your siding, discuss replacement options, and provide an honest recommendation. We offer siding replacement cost estimates on all our work in Minnesota, so call us today at 1-855-573-1653 or click below to get started on your home siding upgrade. Get a Siding Quote Today! Description: After a hail storm caused severe damage to this Stillwater home, the homeowners were able to upgrade their siding and gutters to a more modern look with help of Minneapolis contractor Trinity Exteriors. Description: Hail impact marks from a storm in spring 2015 meant both the siding and roofing on this Stillwater home had to be replaced. Hail damage from a fall storm forced these homeowners to replace their roofing and siding. After a free inspection from Trinity's restoration consultant, and once the homeowner's insurance company improved the claim, our crews replaced the old shingles with new Tamko Heritage in Rustic Black. Our team also upgraded the siding to Mastic Carvedwood Double 4" in Scottish Thistle, one of the more popular vinyl colors we sell. Hail damage caused severe damage to the roof and siding of this Inver Grove Heights home. One to make lemonade out of lemons, the homeowner upgraded the home's curb appeal with staggered shake in the gable (James Hardie Hampton Red) and Mastic vinyl siding in Pebblestone Gray. The new shingles are Tamko Heritage 30 in Weathered Wood. Hail stones pummeled the Inver Grove Heights area in late 2016, which meant homeowners in the area were bombarded by all sorts of contractor. These residents found Trinity Exteriors and, after an initial inspection to determine if there was any hail damage, the insurance restoration process began. Our storm restoration consultant helped the homeowners understand that after they filed the claim with their insurance company, their consultant would be on site when the insurance adjuster conducted their inspection. We do this simply to help point out damage. Once the claim was approved, our project manager was onsite while crews installed new Owens Corning Oakridge shingles in Flagstone. The siding also showed dents caused by hail, so our crews installed new vinyl Mastic siding in 5" Tuscan Olive. "Their communication and customer service was outstanding!..." "I called Trinity Exteriors about putting new siding on my..."
If you decide it is time for new siding, we will guide you through the entire re-siding process. A Trinity Exteriors, Inc Representative can assist in choosing type, style and enhancement options ideal for your home in Greater Twin Cities Metro Area, and we will see the project through to the finishing touches. Our professional siding installers and project supervisors are experienced and trained in all types of siding applications. In addition, Trinity Exteriors, Inc offers a wide variety of fascia, soffit and gutter colors to match or complement your siding colors to further enhance the beauty and value of your home or business. If you have any questions regarding your siding or have been considering replacement, please do not hesitate to contact us for assistance. While many homeowners put a considerable amount of time into their interior remodeling, the exterior renovation is usually at the bottom of the to-do list. Specially trained designers at Trinity Exteriors, Inc can show homeowners how small changes such as shake, or a different color trim, can be the first step in transforming the look of their home. The right material. Engineered wood siding is a great a balance of durability and appearance. If you love the look of wood but want a more durable, lower maintenance material, engineered wood siding is the ideal option. Engineered wood siding is composed of treated wood fibers and resin, creating a stronger material. The manufacturing process creates a water-resistant material that, when pre-finished, won't require any significant maintenance. 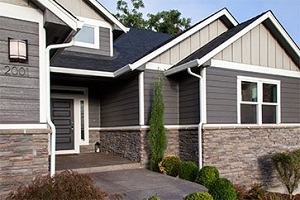 Trinity Exteriors, Inc installs quality engineered wood siding, including LP SmartSide Siding. Our experts can help you get the perfect material and design for your home and provide you with an expert installation that creates a beautiful new look for your home. EDCO Entex®–Coated is the steel siding option that allows you to have the best of both worlds! Unique, earth inspired color selection. 35 year fade protection warranty through EDCO. Coated with AKZO Nobel's cool color technology to promote energy efficiency. Enduragrain texture creates a natural wood finish. PVC-Coated Steel Siding pairs timeless beauty with minimal upkeep! PVC coated for added protection. Resists wear & tear as well as rust. At Trinity Exteriors, Inc, we realize the importance of working with a professional to ensure perfection for your siding needs. That's why we have a decade of experience specializing in siding built to withstand Minnesota weather. Not only will your home be better protected, but it will also outshine your neighbors' homes when you choose to install new siding. New siding offers great benefits for your home, so don't wait to call us for an upgrade! We offer cost estimates on all our siding installations and other exterior improvement services in St. Paul, Minneapolis, Eden Prairie, Burnsville, Minnetonka, Cottage Grove, Inver Grove Heights, Savage, Chanhassen, Rosemount and the surrounding areas.